Prominent & Leading Manufacturer from Pune, we offer fume extraction systems. 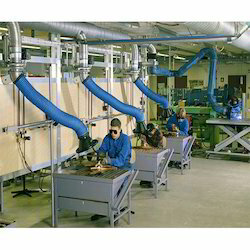 We are among the reputed organizations engaged in manufacturing and supplying Fume Extraction System for Soldering. These Fume Extraction System are extensively used for separating particulate matter from dust laden air. Our professionals follow the established guidelines of the industry while manufacturing these extraction systems.